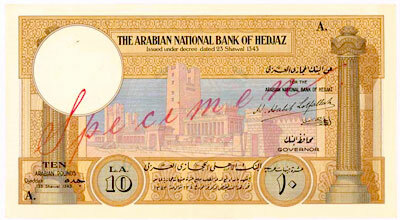 The banknotes of the Hedjaz (region in the west of present-day Saudi Arabia) first came to the notice of the international collecting community in 1954 when four notes were offered for sale in the auction of King Farouk’s numismatic collection. These notes were included in a 350-piece lot of paper money that sold for about US$160.00. 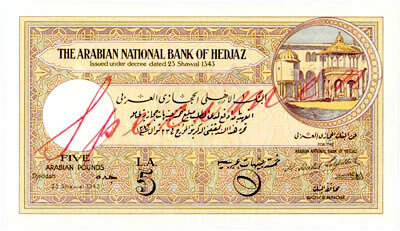 While this brief mention of the notes was probably overlooked by many people at the time, the notes prepared for the Arabian National Bank of Hedjaz soon became an enigma amongst collectors. 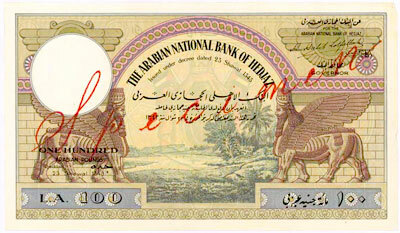 Firstly, the notes were never issued, with only unissued and specimen notes being known. Secondly, there had been nothing reported of the issuing authority, which appeared never to have existed. 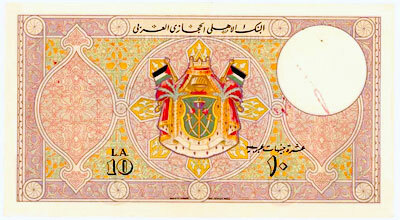 Finally, the illustrations on the banknotes include decorations and illustrations of scenes that are not in, or of, the Hedjaz. 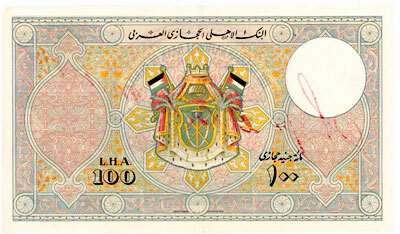 Why would someone prepare notes for issue in the Hedjaz and then place scenes from Lebanon, Syria, and Iraq on the notes? 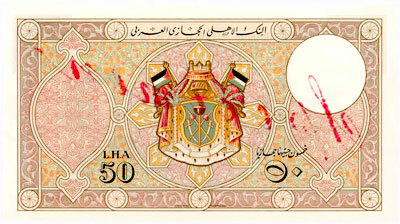 The mystery surrounding these notes has in part been due to their infrequent appearance on the collector market. One of the few recorded sales of a note was during the 1980s when the American dealer Ted Uhl sold a 100-pound note without serial numbers. 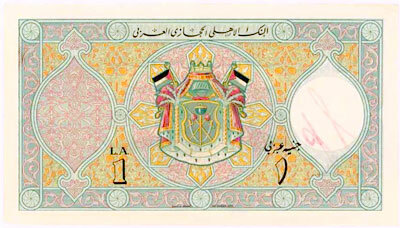 During the 1990s copies of unissued notes were offered for sale in the United States of America. The Ka’aba and the courtyard of the Holy Mosque in Mecca Coat of arms. The fountain and the treasury within the courtyard of the Great Mosque in Damascus Coat of arms. with the pillars of ‘Jachin’ and ‘Boaz’ depicted to either side of the illustration Coat of arms. The Roman ruins at Baalbek in modern-day Lebanon, with a cedar of Lebanon in the left foreground Coat of arms. Two winged bulls with human heads frame a scene of a river, which is probably the Tigris. The winged bulls are copied from decorations found at Sargon’s Palace at Khorsabad. 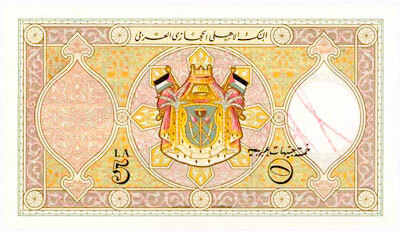 In the top corners of the note are depictions of winged suns. During the Assyrian reign of Mesopotamia these devices symbolized the god Ashu. Coat of arms. 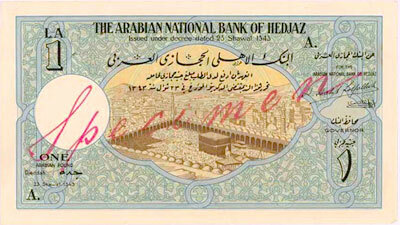 The simple reason for the use of these illustrations, that included buildings and scenes outside the Hedjaz, is that Habib Lotfallah was an Arab nationalist and he anticipated that, one day, his notes would circulate not just in the Hedjaz but in all Arab countries. 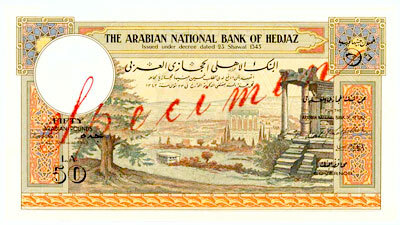 This is why the title of his bank, no matter in which form, always used the words ‘National’ and ‘Arabia’ (or ‘Arabian’) and why illustrations from Lebanon, Syria and Iraq are used on the notes.